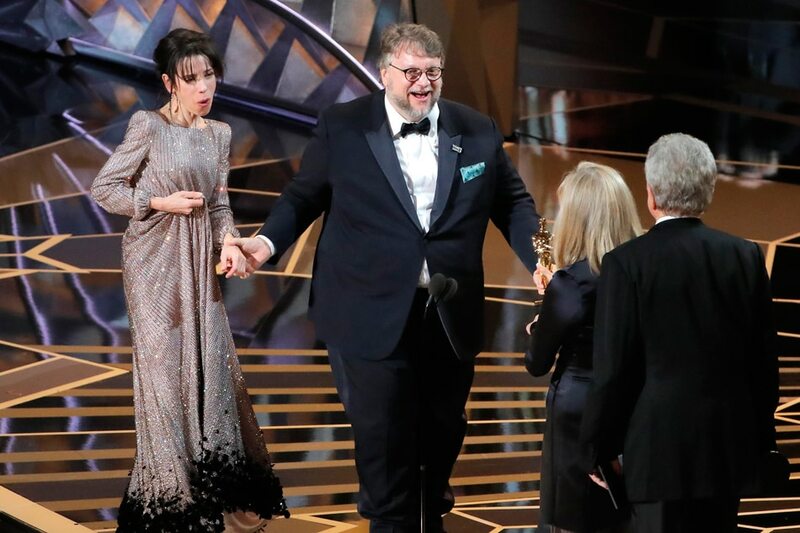 LOS ANGELES -- Guillermo del Toro's entire, dazzling career has been built around a fantastical world of outlandish creatures -- an elaborate universe he says he built by the age of 11. The Mexican filmmaker -- who won best director honors on Sunday for his lush fantasy romance "The Shape of Water" -- is known for the monsters, vampires and superheroes that populate his creations. They have earned him a mantel full of awards, including the Golden Globe, a Directors Guild prize, a Bafta and now the Oscar. And all of them emerged from the experiences of a young boy growing up in Guadalajara who loved exploring sewers, was fascinated by black magic and had a werewolf for a stuffed animal. Del Toro, 53, has called "The Shape of Water" his first "grown-up movie." Set against the backdrop of the Cold War, the genre-defying film is a love story between a mute janitor at a top-secret US government research facility and a strange amphibious creature being held captive there. "It's his masterwork to date," said Mexican film critic Leonardo Garcia Tsao, a longtime friend of Del Toro's. "There was a very Guillermo element missing (from his previous films), and that was humor," he told AFP. Previous Del Toro films such as "Pan's Labyrinth" and "The Devil's Backbone" -- both filmed in Spain and set during the Spanish Civil War and its aftermath -- were darker, with themes like loss and yearning. "The Shape of Water" is, at its heart, an optimistic movie. But the connecting thread running through all his films is his magnificent monsters, and the human villains who, as Del Toro himself has put it, turn out to be the real monsters. Del Toro grew up in a devoutly Catholic family, with a poetry-writing, Tarot card-reading mother, and a father who won the lottery when Guillermo was young and used the jackpot to build a car dealership empire. As a boy, Del Toro set about turning the family's gleaming new modernist mansion into a haunted house populated with hundreds of snakes, a crow and rats that he sometimes cuddled with in bed, according to a 2011 profile in The New Yorker. "All that I am, in the sense of my artistic obsessions and the stories I tell, comes from the first 11 years of my life," he once told Mexican magazine Gatopardo. "I think the essence of who we are is formed in those early years. Afterwards, we spend our lives mending what got broken and building what didn't." His grandmother was a major influence, and close relationships between children and the elderly are a hallmark of his films. His debut film, "Cronos" (1993), tells the story of an elderly vampire who does not want eternal life, and the granddaughter who helps him. It is the only film he has directed in Mexico, a country he left in 1998 after his father was kidnapped for a $1-million ransom that Del Toro only managed to pay with the help of fellow director James Cameron. "It's something we never talk about," his boyhood friend Mariano Aparicio told AFP. Del Toro's first Hollywood movie was "Mimic," in 1997. He has described it as a hellish project with limited creative control and abusive treatment by producers Harvey and Bob Weinstein. After that, he insisted on putting "his own signature" on his films, said A.P. Gonzalez, professor emeritus at the film school of the University of California, Los Angeles. "He's a true artist," Gonzalez told AFP. Del Toro is one of the so-called "three amigos" of Mexican film along with fellow Oscar-winning directors Alejandro Gonzalez Inarritu ("Birdman," "The Revenant") and Alfonso Cuaron ("Gravity"). "They have very different styles, but Guillermo is the only one who has constructed this very recognizable world," said Garcia Tsao. He calls his friend a "genius" -- but one who is not afraid to tell dirty jokes or go on "gastronomic safaris" with him. "He's a very charming person, a generous guy and very friendly," he said.